Carpenter Ant prevention: Why winter matters? Carpenter ants live in wooden structures that are moist or that are already infested or damaged by other insects. If you want to check for carpenter ant infestations in your place, you should check for their nests in places such as chimneys, sinks, voids in the walls, damaged wooden areas in the doors & windows and the like. When you don’t detect them on time, they will start decaying all the wooden furniture and fixtures in your home, costing you a lot of money in repairs & maintenance. Though they reside in wooden places and cause decay to the structure, these carpenter ants don’t consume wood. Like most other species from the ant family, carpenter ants too feed on sugar and sweets. They love getting their daily dose of protein in the form of pet foods and meat. Though they are very active all through the year, carpenter ants are believed to hibernate and settle into their shell during the harsh winters. An important point to note here is that carpenter ants hibernate only if there is an absolute need for the same. They are very active during the season preceding the winters and they eat a lot of food in this time so that they can stay without food all through the cold winters. If you are looking at a proper season to check for carpenter ant infestations in your home and keep them at bay, winter is the best season to do it. However, if these ants have a warm colony to settle in and a food source nearby, they don’t hibernate during the winters. They stay quite active even if the outside temperature dips below 0 degrees as long as they feel warm inside their colony. They never come out of their hide-outs if the temperature gets quite cold and they are blessed with the quality of going without food for an entire season! If you spot your pet food supplies coming down and pieces of rotten fruits or sweets lying around the wooden furniture in your home, you should stay alert and watch out for infestations from carpenter ants. 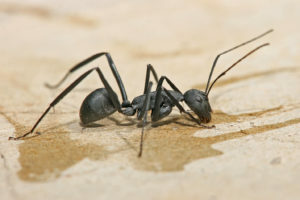 If you thought you could eradicate these ants by killing the ones that you spot crawling over your home, you are wrong. The nests of these carpenter ants are located in remote locations that are moist and dark. You need to get rid of these nests if you want to keep your home free from carpenter ants. The season of winter does matter for taking steps for carpenter ants prevention because this is the time when the ants remain dormant during very cold days. They might pause their activities for one day at least during this season, which makes it the right season for you to call up an expert and eradicate them. During the other seasons, these carpenter ants are very active, and it becomes difficult for you to identify all their nests. Yes, it is not mandatory that these ants would hibernate or remain inactive during the harsh winters. It is only when they aren’t able to stay warm in their hideout and don’t have a food source nearby that they choose to be dormant. Hence, it is up to you to make full use of this dormant stage and identify their nests with an expert to keep them at bay.